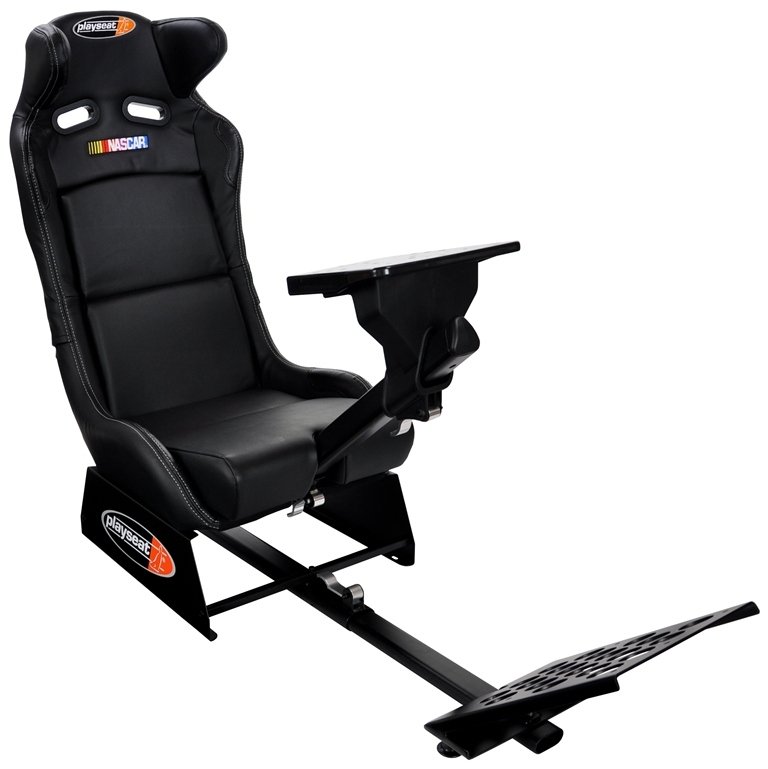 Introducing the Playseat NASCAR licensed Racing Seat. Seat upholstered with high quality vinyl, which has a leather look and feel. Aluminum quick release handle allows for easy adjustment of steering and pedal platforms. Compatible with the Playstation2®, Playstation3®, Xbox®, Xbox 360®, Wii® Consoles and PC's. Compatible with most console and PC steering wheel and pedal sets on the market. Introducing the Playseat NASCAR licensed Racing Seat, the next level in the ultimate gaming experience! Consisting of several new modifications not found on the Evolution, this chair provides ultimate comfort with a unique style to boot! Modeled after the dynamic race seat styling featured in real race cars, complete with head stabilizers, the NASCAR Racing seat is the perfect way to bring the NASCAR racing experience home! The Playseat NASCAR Racing Seat includes extra strong, lightweight, black powder coated tubular steel frame with high-tension spring, and wire system. High profile side bolsters with Ultra high-density foam is fully upholstered in high-quality synthetic leather with official NASCAR branding. The seat also includes reinforced synthetic leather patches in the high wearing areas. Removable seat back and base cushions, an integrated side head protection system and patented foldable system in the back of the seat for easy and fast storage. Seat chassis and Pedal support framework features extra strong, heavyweight, powder coated steel chassis with special oval steel tubing to the pedal support plate and aluminum quick release handle for multi point adjustment of the gas, clots and brake pedal set. The new steering wheel support includes the newly patented fully adjustable steering wheel support with aluminum quick release handle for easy adjustment of height and length and universal steering wheel plate for almost all wheels in the market. Adaptable to Playstation2, Playstation3, Xbox, Xbox 360, Wii, and all computer game platforms. New designed extra strong, powder coated triangle tubing with extra space for putting through all wiring and PU protection between tubes to avoid scratching of the powder coating. Recommend for ages 14+. *Note: The Playseat hardware support plates are manufactured with pre-drilled holes to accommodate most Logitech gaming peripherals available on the market exclusively. Industrial strength velcro is included with this set to attach other 3rd party manufacturer peripherals (Thrustmaster, Fanatec, etc.) to the Playseat support plates when the pre-drilled holes do not align with the hardware. Please contact the manufacturer with questions regarding 3rd party peripheral compatibility with Playseats. Wheel and pedals not included.